Tallinn Town Hall is the very heart of the Old Town. It is considered the oldest town hall in the Baltic countries and Scandinavia that has made it through the annuls of time. It is also the only surviving Gothic town hall in Northern Europe. The hall was first mentioned in the 14th century, but the original Town Hall was first founded more than a century earlier. Later, in 1402-1404, it was replaced with the current Gothic monument made of limestone. The hall’s walls have been a witness of many historical events that were happening for the last 700 years. The construction of this two-storey building with a roomy basement was finished in 1404. It is situated right next to the marketplace and still remains the most important representational building in town. The Hall once served as the home of the city administration for nearly 700 years, until 1970. Today the building still remains incredible both on the inside and on the outside. It is opened for visitors and is also used for official receptions and concerts. Inside you you can visit a Trade Hall, the Council Chamber, the vaulted Citizens’ Hall, and a small kitchen. Besides that you will also see some vaulted roofs and brightly decorated colonnades, while on the outside you will admire the view of the building’s slender tower, topped with a Renaissance spire, which is 64m tall. 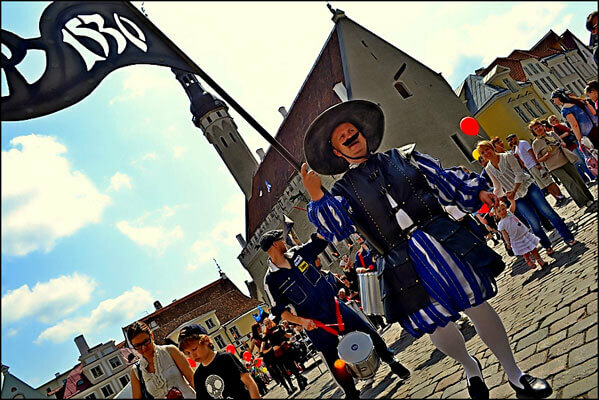 Old Thomas (Estonian: Vana Toomas), the weather vane on the top of the hall’s tower has become the symbol of Tallinn. Old Thomas is the symbolic guardian of the city. He has been keeping an eye on the city since 1530. You have an opportunity to see the city from almost the same angle as Thomas, as you can climb the 115 steps to the top of the tower. Legend tells that this elegant 64 meter structure was designed on a sketch made by an explorer following his visit to the Orient.